In October I embarked on a cross-Canada tour talking about the ways that loving our neighbours is changing our lives, our hearts, and our communities. In each city I met amazing people who are discovering this new way to live, and each had a story that marked a deeper and courageous shift. One person I met had never lived in the same place more than a few months and began to question her life pursuit. Although she had chased after everything she thought she needed to have the Good Life, she felt that she was missing something. So she decided to do something bold. She decided she would stay where she was and love the people around her, no matter who they were. She discovered that the best life was not one centred around procuring stuff and she was tired with her life that seemed to pivot on what others did or did not do for her. Rather, she embarked on a journey in a new direction and towards her neighbours. She was starting to see that being a neighbour, loving others, pursuing peace, and creating beauty where she lived, was exactly the point from which she would discover a new way. It was a beautiful story. It takes bravery and courage to stop and take stock of our life. Neighbourism is about a deep shift towards others and that often requires some intentional self-reflection. Do I live my life in insolation? Are others incidental to me? To look around with fresh eyes and a renewed imagination is a big step, but those who take the step towards their neighbour and into their neighbourhood discover something special. They find that the big brave step did not produce fear, but whimsy. The novelist Jules Champfleury wrote, “There is no more intrepid explorer than a kitten.” He is right. We often imagine bravery as hard and majestic, an undertaking fit for only the strongest and best prepared. Yet kittens venture into the big world with curiosity and delight. 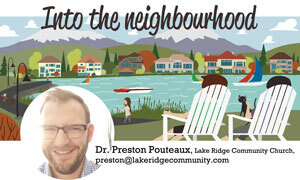 They have something to teach us about how we step into our neighbourhoods. No expert, government or professional will transform your neighbourhood. Your neighbourhood is uniquely yours and the people around you are a part of your story. I got a call from a person in a Canadian city asking if I could come and fix their neighbourhood. I had bad new for them: I can’t do it. No one can. Only those who live in your neighbourhood can initiate and sustain the kind of transformation you want. What your neighbourhood needs is you and a dose of intrepid whimsy. What your neighbourhood needs is real people, planting themselves in the midst of a messy community, and showing tangible, simple, and ongoing love. It may be small and subtle, but it could be the bravest way to live that I know. May you see yourself as the intrepid neighbour, full of curiosity about a better way to live. May you step with boldness and hope as you love your city and the people around you. In doing so, you may discover that giving our lives for others gives back in ways we could never have imagined. Fear destroys but intrepid whimsy opens doors to new life and a new way of life.